Baynatna is the first public Arabic library in Berlin, opened on 18th February 2017. “Baynatna” means “between us” in Arabic: this very popular phrase creates a special kind of intimacy between people who agree to share insights, thoughts or stories even if only just for second. In the process of establishing Baynatna, our international team relied on humor, trust, and sensibility to facilitate a space for dialogs no one knows where exactly they may lead us. 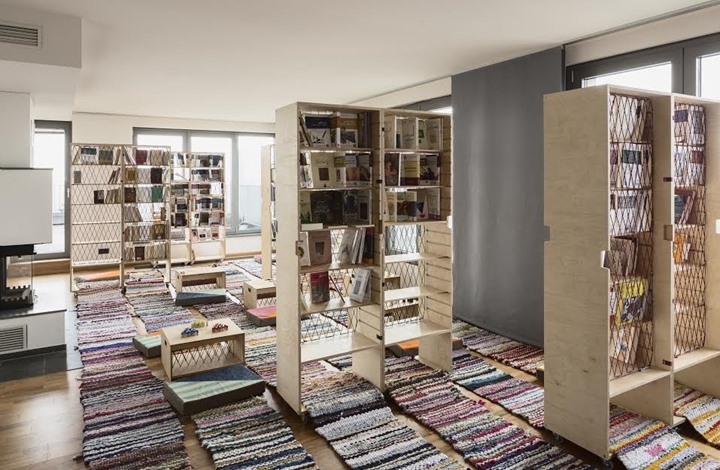 An architecture class from Berlin’s Technical University designed and donated movable shelves and furniture that can be folded out to create a comfortable and warm space that remains open to everyone. The library continues to grow based on book donations and voluntary work. Baynatna provides as a safe space for a generation of readers who have lost not only their homelands, but also their books. Our book collection allows the readers to experience a taste of the home they have left and to become acquainted with worlds previously unknown to them. We use the power of stories to convey cross-cultural experiences and to foster an inclusive and progressive environment. On one hand, we provide literature to newcomers who, coming to Germany, are deprived of reading in their native language. On the other hand, we aim to have Arabic works translated into German and/or English so that people in Berlin can discover the long literary tradition that we have to offer. We spark discussions not only with the books on our shelves, but also through weekly live readings, music performances, and workshops. Baynatna is currently based at the Zentral- und Landesbibliothek of Berlin, Breite str. 30-36, 10178. Welcome!